Chepe carried his lunch to a table where he could see everything around him. Slipping the bag containing his guitar off his shoulders, he laid it on the seat next to him as he sat down and quickly ate the lunch he had made. He wanted to have time to practice a little bit before going back to class. Chepe always took every opportunity he could get to practice a little and thanks to Keylee's gift he could easily do it. Better would have been if Chuck and Aaron would have been here with him but he didn't see either of them in the cafeteria yet. If they arrived maybe they would join him, but he doubted it. He hardly knew Chuck. Chepe ate the baked maple chicken and brown rice with maple butter sauce in about ten minutes, and after putting all the trash back in the paper bag. he threw it away in a nearby garbage can. Walking back toward his table he decided now was the perfect time to practice his music. After he'd finished the song, he moved into another song...which required him to use his voice. He intended to use the rest of the lunch break to practice...at least until Lena came to find him. Vaguely he wondered when Lena planned to use the dare she had won from him by catching him the previous day during their game. He pressed play on the tape player and soon joined in with his guitar. He swayed from side to side as he sat on the bench, tapping his foot as he sang. He turned his head to one side as his hair fell across his bright green eyes. He closed them partway as he let the emotion fill his voice. He really did love playing music and he could happily have done it all day. Chepe lifted his head as the song progressed, looking, apparently past the students who were arriving for lunch. Thoughts were running through his head as he continued with the song, his hands automatically moving over the strings of his dad's guitar. His green eyes were full of expression as he sang, thinking about each line carefully to make sure he got each one to sound the exact way he wanted it to. Chepe leaned back as he began a third song, his hair still hanging in his eyes as he smiled. He loved this song and it had been one his dad had done. He had heard his dad playing it many times when he practiced and it was the first one Chepe had played all the way through with no mistakes. As such it was one of his favorite ones. He rested the guitar on his leg as he played, a small smile on his face. The song really was a beautiful one and he remembered how much his dad had loved it. He didn't care if anyone was watching or even knew he was playing since he was doing it for himself. He was enjoying the music and he felt closer to his dad when he was playing. It was the same feeling he got from practicing on his mom's piano and from cooking. His mother had been skilled at both the guitar and piano but piano had been her favorite. She had insisted Chepe learn to play it as well and he had worked hard at it until he was as good on it as he was with the guitar. He closed his eyes as he finished the last song up. Leaving the guitar in his lap, he grinned over at Gadiel. "Hey," he said. "What did you think of that PE class? I thought it was great!" He pushed the long black hair out of his eyes. Gadiel went to the cafeteria and quickly found his cousin. He hurried over as Chepe was eating. Gadiel's long red ponytail was hanging down his back the wind blowing strands of long red hair.He sat next to Chepe, a smile on his face. Gadiel was lost in thought as he ate his food. He had been happy when his mom had told him Chepe and his siblings were going to be moving there and that they would be living with them. And then she had dropped the bomb that she was setting up the younger two to dorm at the school during the school year and that they would only be at the house during summer vacations. He had been disappointed because he had remembered all the fun they had together when they were little. He had often played with Chepe and Lena because the two of them were almost always together. There were a few rare times when he had managed to talk his mom into taking him to Chepe's house or the park and Lena had not been there. Gadiel smiled at the memories. People had asked if he and Lena had been family because of the red hair that both had and both would say at the same time, No! His mom had made a comment about starting a beach cafe that would be open during the summers and if it went well for her she would consider having it open the rest of the year too. He was so lost in the thoughts he was having that he jumped when Chepe started playing his guitar. Listening to his cousin's playing, he let his mind wander again. Looking up from his meal, he noticed a few people had been watching his cousin play and Gadiel shook his head and concentrated on eating again. He knew how much Chepe enjoyed playing and that he was likely to play the same songs over again. He was certain that Chepe had decided to use this time for practice. Mina hurried from the locker rooms after changing, feeling much cleaner and more comfortable. She carried the large back containing Chepe's birthday gift into the cafeteria with her, and she searched the tables for him. Spotting him, she hung back, watching him as he began playing his guitar. She would never admit it but she thought he was amazing at it. She smiled as he breezed through the songs he had begun to play and she stayed back so he wouldn't see her watching him play. She would approach him when he was finished and she would give him his new gift once she could see he wasn't busy.After a little while he appeared to have stopped playing and started talking to the red headed boy beside him so she took the opportunity to walk over to him. Mina reached the table he was sitting at and said, "Hi...Here's the birthday gift I intended to give you last night." She gave Chepe a flirty little smile. "I really hope you like it." She looked over at his friend and laughed snobbily. "Anyway Chepe open it quick!" Chepe saw the blonde girl coming up on them. "No...not Mina" he muttered under his breath. He watched her come over to him and Gadiel. He did not want to see her. When she shoved the bag at him he automatically accepted it, while glaring at her. "why are you still buying stuff for me?" he asked her. Leaning back against the table, watching her. When she told him to open it, he did, absently and uninterested in whatever she had decided to get him. Pulling the bags off the object, he was shocked to see a new guitar...a newer version of his own. The black wood shone brightly on the beautiful new guitar but it was an insult to Chepe that she had decided he needed a new guitar. He would never use it so why had she wasted the money on it. Chepe just looked at the new guitar, obviously not happy with it. He held his own against his body as if he thought Mina was going to try tearing it out of his hands. He looked at her. "I don't want it." He stated flatly with a frown on his face, his expression unhappy. "Yeah class was great." Gadiel said, grinning. "It was one of the best classes we've had." Gadiel saw the unfamiliar blonde girl come over and he was curious why Chepe didn't seem happy to see the girl. He wondered why but it wasn't any of his business so he made no comment and just smiled kindly at Mina. He was a bit surprised at the gift Mina had gotten Chepe.....and he was shocked how stupid Mina had to have been to give it to him. Shouldering her bag, Shiana went into the large cafeteria for lunch. She didn't yet know what she was going to eat. She was incredibly indecisive and she was horrible at making up her mind. She ran her hands through her straight red hair as she looked around. How would she ever decide what she was hungry for? Shiana smiled to herself. This was going to be annoying. She had come to meet her older sister, Leilani for lunch here, and Shiana would always take any excuse to come visit Valevay. She thought the cafeteria was much nicer here....and the food was better too. CJ casually walked into the cafeteria and sat at the nearest table he found. He intended to watch for his sister to arrive. He hoped that she had had a decent class and he was worried that she might have had a hard time of it. He was tense and his eyes were in constant motion, scanning the area for any glimpse of Ricki. He fully intended to eat with her, and he assumed she would want to eat with him too. He fiddled with the patched knee of his jeans and leaned forward, resting his elbows on his knees. Ricki had loved her class and she walked gracefully into the cafeteria, her short purple dress brushing her legs as she walked. She was cradling her back pack in her arms as her deep green eyes searched for the familiar form of her brother although she wasn't really wanting to go to him yet. She wanted to meet students and try to make friends first. Smiling she slipped unseen around her brother and soon was among the other students. Ricki ran a hand through her long, silky black hair as she looked around. She hoped someone would come talk to her and she stood there unsure of where to go. Ricki smiled again, excited about the new school all over again. It was going to be a new experience and she couldn't wait to meet people. Both guys and girls. She was unaware how innocent she looked standing in the middle of the cafeteria like she was. Anya cautiously entered the cafeteria. She had learned to be careful no matter where she went. She never knew when she might see a spirit and she had stopped taking for granted that she wouldn't see one. After all she was a fairy and a fairy couldn't take things for granted. She knew she could never let anyone in school know that she was a fairy otherwise she would be never left alone. Everyone would want to know what it was like. Anya knew she was pretty. All fairies were quite lovely. It would have been impossible for her to not be pretty. She smiled a secretive smile as she continued on further into the cafeteria. She had secrets no one else knew and she was determined to keep them to herself. She knew it would be hard to not let slip that she could communicate with spirits if she happened to see one in school. Mina frowned at Chepe. "Why don't you want it?" She said. "It's brand new and plus it's the newest version of that one." She gestured at the guitar still on Chepe's knee. "And it looks a hundred times better, if I do say so." She looked at his face with a sweet smile. "I want to see you playing a NEW guitar that is fitting for your talents, not an old piece of junk." She twisted her long blonde ponytail around one of her fingers. "You'll look great with this new one." she said. She moved closer to him, running her fingers over the black guitar Chepe was holding out away from him, so that it wouldn't harm his own by bumping it and putting a scratch on it. She turned and headed off toward another table. "I'll talk to you later Chepe!" Chepe sighed. He knew Mina would never listen. But he didn't want the insult of the black guitar anywhere near him. Setting it near his feet, still holding his own, he thought that maybe his sister would like to have it. He would never use it and so he decided he would ask Tesanee if she'd like it. If she didn't want it he was sure he could find someone else who would like to. He looked over at Gadiel who had watched the nutty blonde walk away. Chepe could tell his cousin thought Mina had a few screws loose. Chepe grimaced at the sudden sharp pain from the deep gash in his leg. He'd gotten it in the car accident, and it still hadn't healed. He knew it could take months for it to even begin healing properly. Even now, two weeks after the accident, it still broke open and bled fairly often. It was normal for such a deep cut, he knew. He sighed, shaking his head a little. Mina decided she wasn't that hungry so she just sat at her chosen table for a little while. She wasn't sure if she wanted to eat anything, but she knew she would probably be hungry in a little while. She would wait until she actually wanted something. Mina rested her hands on the table and looked around, her long blonde ponytail falling over one shoulder as she took in everything around her. She kept stealing glances back over at Chepe. Finding the cafeteria was simpler than Olivia had anticipated, all thanks to Ah-Gyul and his little handy dandy phone. The dining hall was enormous - lined with red and white circular tables, the colors separating themselves into a visually pleasing pattern. Chattering students filled the tables conversing over their day thus far as the gobbled up their food. Glancing over the sea of people Olivia wondered momentarily whether they’d be able to find an empty seat. Retrieving her student Id, she gingerly held it out to be scanned upon entering the serving area. Her meal plan had been paid for through the exchange student program – leaving little for Olivia to worry about paying for out of her own pocket. Not that money was much of an issue for the Aussie. Although she wasn’t swimming in green her family was well off. Pocketing her card Olivia waited for Ah-Gyul grabbing a cream speckled tray off the nearby stack. Over in the serving area there were several stations set up for student’s to order food- which was to be prepared right then. Most of the lines were rather long especially the one leading up to the grill. On the opposite side of the room there was a buffet set up for self service, that was being tended to on a regular basis by two eccentric ladies in hairnets. They were doting over the upperclassmen going on about how it was nice to see them back for yet another year at Valevay, slipping an extra sweet on their trays as they set out in search for a table. As soon as Ah-Gyul had grabbed his own tray Olivia absently linked her arm with in his, trying not to get lost in the crowd of hungry students, the delicious aroma prompting a near frenzy. “Everything smells so good!” She said leaning in closer to Ah-Gyul so that he could hear her over the blended noise of everyone else. “Anything catch your eye…or nose?” She asked her eyes scanning the room once again. Repeating Olivia's motions with his own card, Ah-Gyul took a tray of his own. He scanned his options, noting the improvement in food quantity and quality from his previous school with a tiny smile. He was surprised to notice Olivia's arm link with his, but said nothing of it. "The grill," the meat-loving Korean commented, "that looks and smells good." Since he had been given the option, and he faintly remembered a request for hamburgers the night before everything had turned sour, Ah-Gyul doubted the Aussie girl would mind it terribly much if he directed her that way. He waited wordlessly in the extensive line until it was his turn to order a Salisbury steak, piling on a decently-sized Caesar salad on the side when it was given to him. He waited for Olivia to order before suggesting they sit outside at one of the shaded tables. "It's less crowded out there, and not too warm out." Teddy slowly entered the room, knowing that he should be cautious of the people around him. He looked around, seeing a girl sitting at a table alone, he tiptoed over to the table. Seeing that she was looking towards the center of the room, teddy thought to himself, "What weird thing can I do to her? ", a crooked smile spreading across his face. Slowly he sneaked over to the girl. Quietly, he sat down silently and quickly reached across the table and tickled the blonde-headed girl. Just as quickly as he had done it, he sat back down at the table and silently laughed to himself. Mina was sitting at her table and watching Chepe talk to his friend. She glared when she saw him carelessly set her gift on the floor while he kept his old guitar cradled on his lap. She threw her ponytail back over her shoulder, angrily. Suddenly feeling someone attack her from behind, she let out an ear piercing shriek. 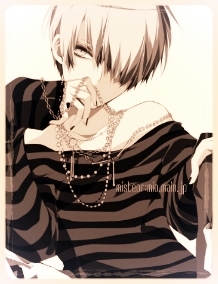 Spinning around toward the table that she had been sitting at, she saw a blond haired boy with a smirk on his face. "What do you think you're doing??" she screamed at him. "You DON'T do that to me....what the hell do you think you're doing????" Mina shot him an angry glare as she brushed her bangs out of her eyes. "I simply cannot believe the NERVE!" she said, with a low angry growl. Suddenly taken back by the outburst from the blonde-headed girl, Teddy spoke up and said "Come on, everyone likes to be tickled. What is your problem?" He laughingly spoke "I have some nerve, you were the one who was not paying attention to your surroundings. Don't blame me for the urge to tickle you. Oh, would you have rather me grab you and give you a kiss? " Teddy slowly got up from the table and walked over to Anya saying "Hi sis. Whatcha doing?" "My problem????" Mina shouted. "my problem is I DON'T know you!!!" Mina glared at the boy. "and for your information NOT EVERYONE likes to be tickled!" she stared him in the face. "And I shouldn't HAVE to watch my back to defend myself from unwanted touching." When the strange boy mentioned kissing her Mina almost lost it. She poked her finger into his chest, almost spitting out the words, in a loud, carrying growl.."If you EVER try to kiss me I will put you through one of these walls." she gestured with one perfectly manicured hand at the nearest wall. "Don't ever think about it," she said, quieter. Anya saw her brother walking toward her, with his customary slow gait. "hello Teddy." she said softly. "I'm not doing much...how about you?" She looked behind him. "By the way, there is a spirit behind you, but don't be scared. It's a benign one so there is no need to worry." She said, "so what are you doing? Did you just torment that poor girl over there? I hope you're not making enemies already, little brother." As Teddy walked away, he looked over his shoulder and called out to the blonde-haired girl; "Aren't we sensitive. It was just a question. Don't worry, I wouldn't kiss you if me and you were the last two people alive." Teddy looked down at Mina's fingers poking him in the chest. Smiling he said " I think you like me because you can't resist touching me." Grabbing her hand, he removes it from his chest and pushes her hand away. "You know you can' kill me, I'm an angel and angels can't die." sneering at the blonde-headed girl in front of him. I am doing good. And no I was not tormenting her, I was...just..well..getting a "feel" for her attitude. She has an attitude of a rabid squirrel, thats what I think." "A ghost is behind me, well tell him hi for me, ok?" Teddy spoke to Anya. Teddy gives Anya a hug and smiles, then says "I think this year is going to be good year." laughing as he commented. Mina stared at this strange boy. What was he thinking? She thought he was quite frankly, an idiot. He thought she LIKED him? When the one boy she wanted was barely 4 tables away from her?? Just the thought of kissing the blonde boy made her skin crawl. She couldn't believe that he had actually touched her. Eeeeewww. When she heard the comment he made about being an Angel, Mina's first thought was that he was a nut. Did he really believe he was an angel? or was he just playing around, trying to make her wonder about his sanity? Mina stared after him, her blue eyes narrowed. "Either way, it looked like tormenting to me. She definitely didn't look like she appreciated being tickled." Sighing, she said, "So she seems like one of those girls who has a bad attitude? Pity, I kind of wanted to get to know her." Anya looked wistfully over at the blonde girl. She wanted a friend. She was glad for this new start. At the old school people wouldn't talk to her when they found out she was a fairy. She could only assume that it was jealousy causing them to act that way. Anya twisted a strand of long, bright blonde hair around her index finger as she watched Teddy. She did love her brother very much. Upon ordering lunch – consisting of a scrumptious looking Hot Panini and a bowl of colorful fruit, Olivia allowed Ah-Gyul to lead her outside. It was a great idea to take advantage of the shaded tables out on the dining patio, not only was the weather enjoyable but it was much quieter outside. The chattering and random shriek in the cafeteria had made it impossible for Olivia to focus on her own thoughts let alone keep a conversation going. Setting her tray down she settled into a chair, taking in her surroundings. The deck was large enough to hold just over a dozen or so tables, which most of them were unoccupied at the moment. Comfort seemed to be high priority at Valevay, each outdoor table was equipped with a colorful umbrella shading the occupants from the scorching rays while they enjoyed their meal. However, the amount of shade provided depended on the position of the sun. As of that moment only half the table was shaded and Olivia had claimed one of the two chairs on that side. Popping a fresh strawberry in her mouth Olivia waited for Ah-Gyul to take his seat. Seating himself directly across from Olivia, Ah-Gyul's back was warmed by the midday sun and his face shadowed. He was much more comfortable in a smaller crowd, though he could play it off in ease if he was in a larger group, as long as he needed to. But this wasn't that time, and so those irrelevant thoughs were tossed away. He rested his arms, parallel to each side of his tray, and held his eyes straight at Olivia's. Tact would probably be good for him, but how would he ask anything without revealing more than was necessary? None of this reflected on his face, but his easily confident look was temporarily replaced by a quiet seriousness. He glanced back at his tray, considering whether he would rather eat first, and talk later, or what--and settled on conversation first. "So," he started. "It has been a little while....how are you?" He offered a small grin and lightened his expression to put his Australian classmate at further ease. They were just high schoolers hanging out, he had no need to remove any mask so soon. Stabbing a slice of mango with her fork Olivia’s blue eyed gaze flickered from her tray to Ah-Gyul’s dark brown eyes. If there had been anyone she trusted here –even a little- she felt it had been this boy sitting across from her. Studying his face a moment she wondered if she could tell him exactly how she had been feeling the last couple days, and if he would understand her worries over the things happening back at home. Although they’d had a conversation about this before –back in Washington- Olivia wasn’t sure if she was ready to bring it up again. Bringing the fork to her lips, stealing the chunk of fruit off of it, Olivia held back bringing up anything that would turn the mood, which was rather nice. “I’m alright; I haven’t had to scrub down a kitchen since arriving here…a much better start to the school year than the previous one.” Olivia stated, an amused smile spreading across her lips at the memory of her time with the International Program. From the food fight to the small kitchen fire - she ended up having to clean up after both incidents, which neither of them were her doing…okay okay she did have a hand in the food fight which had totally been worth it! “How about you? I noticed you haven’t needed any rescuing from colorful girls yet!” Olivia chuckled - hoping Ah-Gyul would get the reference towards his eccentric pink haired admirer.